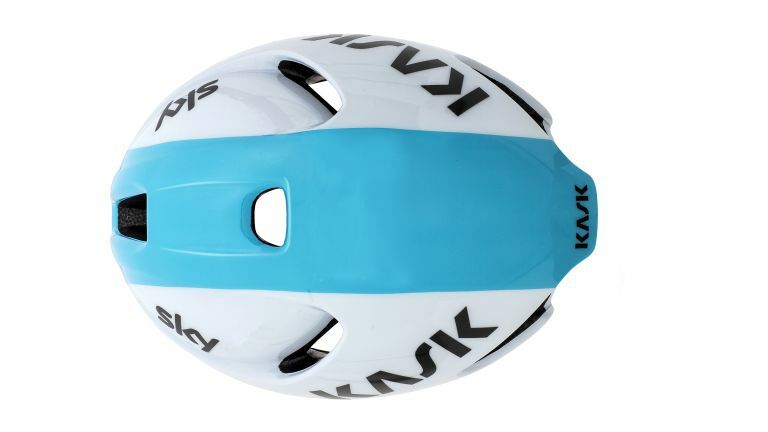 Purveyor of head protection to Team Sky, amongst others, Kask today unveiled its most aerodynamic road helmet, the Kask Utopia. The new lid could help you shave milliseconds off your commute from Cheam to Reading, thanks to next-gen aerodynamics, whilst advanced ventilation should keep you cool. The Utopia will also prevent your head from being obliterated in the event of a bad shunt. It's also very light at 235g (size medium). Quite how you decide a helmet is 'the fastest' is difficult to say. We visited our friends at POC in Sweden late last year, and they were adamant their time trial helmet was the world's fastest, for instance. In its bid to better the best, Kask wind-tunnel tested 10 of the finest road aero helmet rivals, creating a 3D scan for a 'computational fluid dynamics' simulation. The helmets were tested at various speeds and angles (simulating cross winds). The result: the Utopia offered a saving of up to 6 watts when riding at 50kph, versus the best competitor helmet. Seems conclusive. Ventilation is another key factor, as Utopia is designed to be used year-round in all climates. To this end, its "refined design keeps the rider cool, especially when riding at high speed." Utopia boasts breathable, quick-dry padding and 5mm of Resistex Carbon – a "yarn with unique technical characteristics involving a continuous filament of conductive material based on active carbon." In short, this "takes moisture away from the rider’s head and moves it to the helmet’s outer shell." That's great news for the wearer, not so good for anyone in their slipstream, getting a faceful of head sweat. Vents and internal channelling are designed to improve aerodynamics and cooling, while reduced windrush close to your ears means a quieter ride. Developed in association with Team Sky, Utopia was tested in deeply unpleasant conditions. Team Sky will wear it in anger for the first time at the Santos Tour Down Under. They'll be white, as part of the team’s new look for 2018. • Utopia will be available later in the year, in three sizes.